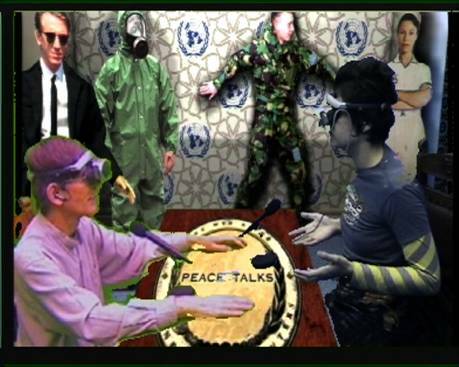 Whilst this installation, entitled Peace Talks, relies on similar principles used in my previous telematic works, it is due to recent technical developments in head mounted display systems that I am now able to produce a far greater degree of total telepresent immersion in this new installation. In combination with Internet based broadband videoconferencing advancements I also have the means to link this installation over geographic distances with far greater ease, and less expense via the net. The technical advancements aside, I have chosen to concentrate on a specific theme, and potential political and social purpose for this installation. Whilst this installation provokes a critique of the so called �peace talks process� and its methods, it also seriously offers a viable and practical alternative to it. As is often the case in telematic installations, the users become amused by themselves in this displaced telepresent context. However, when placed in front of this politically charged backdrop it serves to ridicule the absurdity of a peace talk charade, simultaneously offering a tongue in cheek, yet very viable alternative. The Ames room experiment, an optical illusion creating a distorted reality. Head mounted video displays, resulting in complete telepresent immersion. 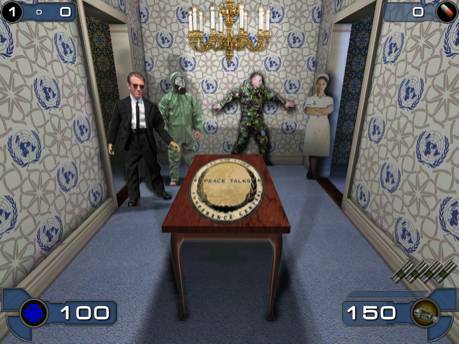 3D texture mapped computer game environment simulating a UN negotiation. Peace Talks functions by linking two remote gallery locations together via the Internet. Users located in identical installation situations are chroma-keyed together into the same telematic space. In this particular installation I have chosen to use Professor Ames 1960�s distorted room experiment as the setting of this telematic encounter. The two users are placed within a shared telepresent environment - four walls and table. However, one of the users/viewers appears to be a great deal small than the other, and when walking around the room their scale will alter in accordance with the optical illusion of the Ames room - explained in more detail later in this proposal. In addition to this disorientating perception of space the users/viewers observe the space, and their shared existence within it via a head mounted video display (a recent technology developed for mobile DVD players). By donning a pair of these headset-glasses the two users will no longer have the ability to control their movements in distant monitors, as in previous installations. Instead they view their own movements via the fixed camera position alone. In effect - removing their eyes from their head and investing them solely within the camera on which they have to rely to navigate within the space. 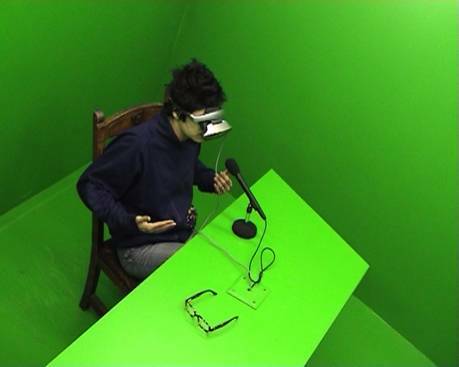 Resulting in complete telepresent immersion.When viewing and listening within the head mounted display, the two remote users will also witness themselves existing together within a computer game environment that simulates a United Nations negotiations room. 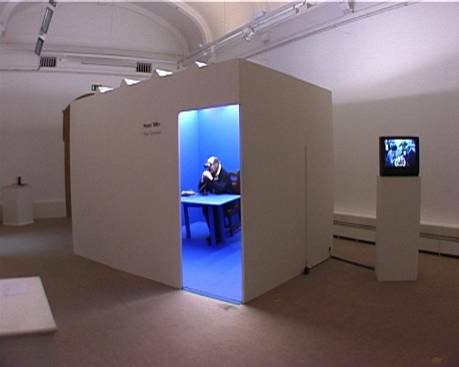 This mapped 3D space will replace the blue box chroma-key background of the physical space and transcend into a typical peace talks room - an official set table occasion, complete with national insignia, papers of declaration and microphones, surround by a gathering of virtual characters with contrasting roles within the conflict. Developed in the 1960�s by Professor Adelbert Ames Jr. of Dartmouth College USA, the Ames room is a specially constructed room that, due to size and shape constancy, looks normal. Actually, the walls and windows are trapezoidal and one corner is much farther away from the observer than the other. Research indicates that the Ames room illusion can be explained by the lack of cues normally used in three-dimensional shape constancy. Most of the static, monocular depth cues are ambiguous, giving rise to several possible interpretations. Because of that, previous knowledge, familiarity with images, expectations, etc. have a strong effect on the interpretation of these cues. (Dorward & Day, 1997). 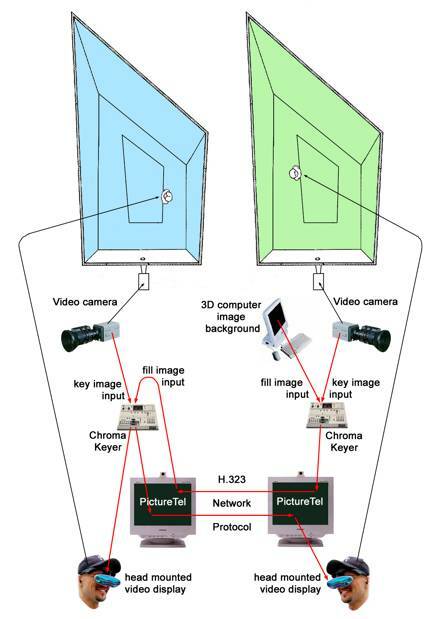 A trapezoidal table is constructed using the same monocular depth perception principle as the Ames room, allowing two remote users to appear at different sizes sat at the same table. Computer game simulation of a UN negotiations room mapped onto background environment.